When Criminals and Cabbages Collide. Eureka Classics bring us Stanley Kramer‘s (Inherit the Wind, Judgment at Nuremberg, It’s a Mad Mad Mad Mad World) classic two men on the run film. 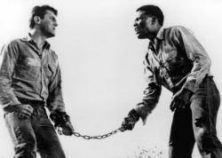 A film made during the height of the racially sensitive USA in the mid 1950’s. This Academy award winning film (Best Cinematography, Black-and-White, Best Writing, Story and Screenplay—Written Directly for the Screen) is all the better for being filmed in black and white as it brings out the harshness of the drama and the poles apart situation of the main characters. Though this film has been classified as a U certificate film, modern eyes and ears may find the dialogue and treatment of certain characters in the film to be offensive to current views on racial discrimination. It is dark and very wet as a covered truck ploughs through the puddles with nearly zero visibility. We hear a song (Long Gone, Chris Smith) being loudly sung from the rear of the truck as the guy in the front yells for him to shut up. Still the singing goes on, he shouts again to no avail. 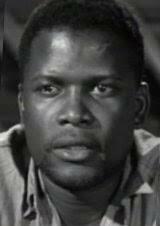 Then we see in the back lots of guys all shackled in pairs and the one singing is Noah Cullen (Sidney Poitier, Blackboard Jungle, Edge of the City, Porgy and Bess) and the one he is shackled to is John ‘Joker’ Jackson (Tony Curtis, The Vikings, Some Like It Hot, Operation Petticoat, Spartacus) who also takes offence at the song. Then out of the night comes some blinding lights and two trucks skim each other sending the prisoner lorry off the road and it overturns down an embankment. We next see the truck in day light, when the police arrive assessing the damage and who has survived and who has escaped. It is down to Sheriff Max Muller (Theodore Bikel, My Fair Lady, The Enemy Below) and state policeman Capt. Frank Gibbons (Charles McGraw, Hang ‘Em High, The Birds, Spartacus) to sort out who is doing what and when a group of locals turn up to be deputised they have to be wrangled into a hunting force with them and the blood hounds. Meanwhile Joker and Noah are set free and they must get away. Joker wants to go South, but there is no way that Noah wants to cross the border and get hung, so they head North to the train-line and get away so that Joker can become a man who doesn’t have to say thank you to people that let him park their car. This is the only similarity that the two convicts have in common, but due to their adversity they learn to respect each other. They must find a way to outrun the law and the prejudices that separate them socially. This film is a tour de force in cinematography and is as important now as it was then. 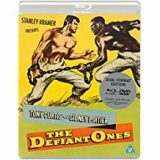 The Defiant Ones is available on Dual-Format. Starring Tony Curtis, Sidney Poitier, Theodore Bikel, Charles McGraw, Lon Chaney Jr.